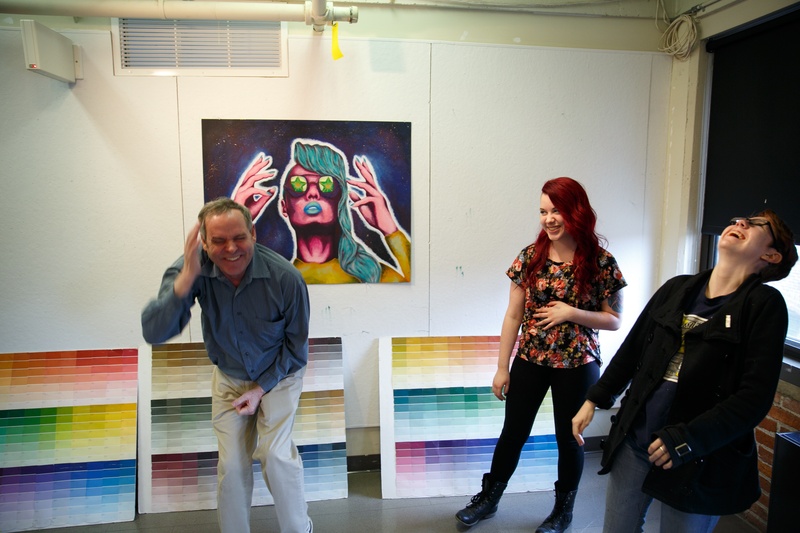 I n his 35 years at Pennsylvania College of Art & Design, Tom Scullin, Associate Professor and one of the founders of the College, taught nearly every student to come through the College. After PCA&D’s commencement on May 5, Scullin will retire from teaching. Scullin, the last remaining Founder to retire, has participated in the institution’s growth from diploma-granting Pennsylvania School of the Arts in Marietta, to associate’s degree granting Pennsylvania School of Art & Design and finally bachelor’s degree granting Pennsylvania College of Art & Design in downtown Lancaster. PCA&D recognized Scullin at the College’s picnic on April 26 and will again at commencement for his dedication and leadership as a teacher, department chair and respected and influential member of the faculty, as well as his generosity to students at the College, evidenced by his gifts of time, expertise and guidance to the students’ educational achievement as artists and people. In addition, PCA&D alumni and friends are invited to contribute to make a scholarship gift in honor of Scullin at http://gvcmp.us/ff49nr. 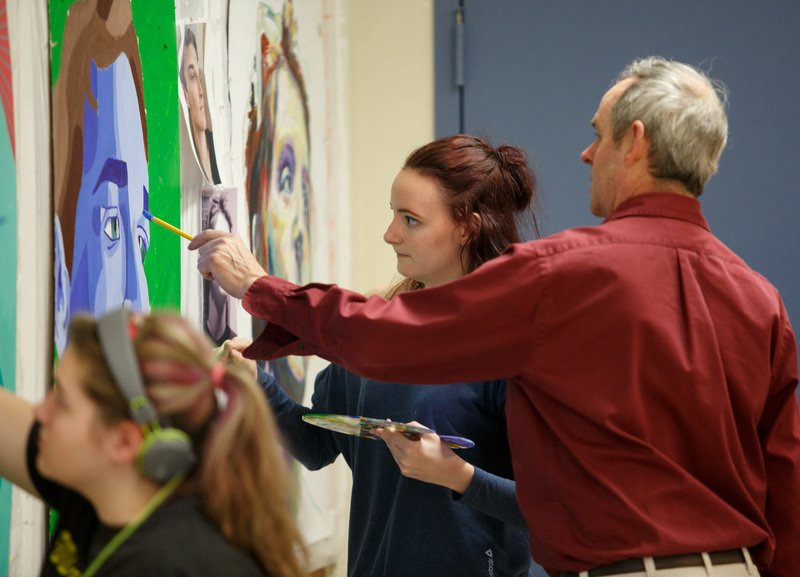 From 1982 to 2017, Scullin taught Foundation classes, the College’s program for all first-year students that emphasize the fundamentals of art making. Scullin’s service to the College has also included both writing and teaching the curriculum of the Foundation department, contributing to standardizing the Foundation Drawing and 2D Design curriculum. Scullin served the institution in many capacities such as the Assistant Dean of Administration, Head of Facilities, and Foundation Department Chair, as well as supporting the College as a member of the Board of Trustees. S cullin received his BFA from the Ohio State University and his MFA from Pennsylvania State University. Soon thereafter he attended the Skowhegan School of Sculpture and Painting. He is a proud founder of and a fulltime associate professor at Pennsylvania College of Art & Design in Lancaster, PA. 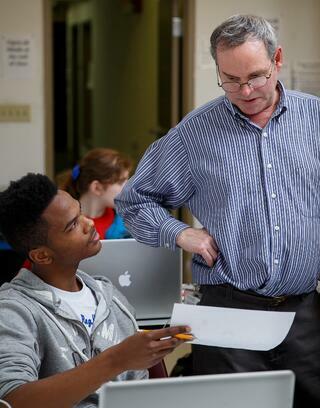 He has 38 years of fulltime college-level teaching experience. Scullin has had 15 one-person shows, the most recent being two showings of his Allegorical Painting at the Ware Center, spring 2017 at the Lancaster City Hall Gallery in 2016. In addition, he was awarded a Lancaster City Arts Grant. Some of his other one-person shows have been in the Jun Gallery and the Hahnemann University Gallery, both in Philadelphia, PA. He has participated in over 60 group or juried shows, winning four First prize painting awards, as well having been exhibited four times in the prestigious Butler Art Museum in Youngstown, Ohio. UPDATE: Tom Scullin, retiring founding faculty member at PCA&D, was also lauded at PCA&D's 35th annual commencement, May 5. Bill Mammarella, Chair of Fine Art, "Tom Scullin is a man who likes to get things done." Mamarella continued, "Tom is like one of the Titans of old, who created the foundations on which we operate. He has his own standards. He served on the board of trustees, did payroll, and was involved with student housing, while he also shoveled bird guano off the rafters of one of the first buildings and shoveled snow from the entrance." "Every year, at first, I would hear the same story from the students. They were perplexed, they might share stories between each other about their Design teacher who inexplicably wrapped his own head in masking tape. But without exception, year after year, by the end of the semester, these same students would invariably talk about Scullin with affection and respect as a teacher who taught them a great deal. Tom was continually updating his projects, and adding to his example reserves. He was paramount in the department’s shift to more digital tools, teaching himself Illustrator and animation software, and integrating it into the classroom." Mammarella continued, "Tom is also one of the most prolific artists I have ever known. Tom is the only artist I have ever known who can paint in 15 minute spells. I mean if Tom has a spare 15 minutes in between other tasks, he can go to his studio and paint for that short stretch and then go back to whatever else he was doing. Because, of course, why waste 15 minutes." "It is his energy, his enthusiasm, and his dedication that built this college. Without Tom Scullin there would be no Pennsylvania College of Art and Design. We all owe Tom our gratitude and respect for making possible everything our college can achieve now and in the future," said Mamarella. Mary Colleen Heil, PCA&D President and David Buckman, Chair of the Board of Trustees, presented Scullin with a sculpture in appreciation of his service.